Fitting in: a topic that may be unspoken but surely crosses most parent’s minds at some point when they have a child with a disability or braces – maybe I should stop at “have a child.” This was, for me, a fear of the unknown when my child was younger. A fear, at its strongest, before she showed me her resilience and strength. I still wrestle with it from time to time but mostly, I learned that things will be okay. That brings me to Daniel Tiger’s Neighborhood, a children’s show on PBS Kids. I am very proud of the writers for helping teach kids about diversity and inclusion. They teach that everyone is different in some ways but everyone is the same in so many other ways. Before I tell you more about the episode, Daniel's New Friend / Same and Different [HD] , here’s the story about why it stole my heart. At some point, nearly every child becomes aware of differences. If the difference is theirs, this may or may not be upsetting for them. It can be more distressing for parents who hope for their child to be able to fit in. Many children in orthotics require more medical attention than average. Watching them go through that intensifies the desire for them to fit in while confident in themselves. Let’s go back to Ariana’s last birthday when she asked for a fish. We went to a pet store to look at them. A man, I’ll call “Ed”, greeted us with a friendly smile from behind the cash register. We said “hello” and slowly browsed. Ariana walked independently instead of being carried. She was wearing a cute dress with her braces outside her leggings, easily seen. Before we got too far, Ed stepped out from behind the counter and said to Ariana, “Hi there, I want to show you something.” From there, he bent down and lifted up his pant leg to show her his brace. Then continued, “I don’t normally show people my braces but wanted to show you that I have braces, just like you!” Ariana looked at me with the biggest smile, happy to have just met a friend. I asked, “Why do you have to wear braces?” and he told me that it is due to Muscular Dystrophy. I thanked him for sharing, we shopped for the fish and left after saying goodbye to Ed. That was that. About a month later, the night of a school party, Ariana asked me, “Mommy, why do I wear braces and my friends wear only socks and shoes?” Caught a little off guard, I said, “Remember how you had a lot of casts to correct your (club)feet?” She shook her head yes. “Well, this is to keep them straight and to help you walk. Everyone is different in some way.” She said, “Just like Ed, the man at the fish store.” She wasn’t sad, just curious. I didn’t know until then that Ed made a lasting impression. I am grateful to Ed for giving Ariana someone to relate to. Then, last week, she was watching an episode of “Daniel Tiger’s Neighborhood” from PBS Kids. To my excitement, a little girl named Chrissie was wearing braces and using arm crutches. The show’s lesson taught about braces, how they help Chrissie walk, followed by how everyone is different, yet the same. I already liked the program because I find it educational but now, they stole my heart. If you haven’t seen it, it could be an episode to watch with your young children. Ariana now often says to me, “I want to watch Christy [sic]”. It makes my heart happy that she has this character. I think the more we can reenforce messages like this, the better. It is great for kids, like Ariana, to see children like them in media. It is great to teach all kids that others are different and it is okay to talk about it and ask questions. This is a lesson beyond braces. It celebrates differences but points out how much we really are the same. At the end of the day, we seek companionship and community. On a parting note, I am encouraged by what I see at my daughter’s preschool today. Kids are kids. They play, boss each other around and, yet, hug each other with huge smiles after a weekend or vacation. The moment I heard most of the kids in her class refer to her as their best friend, I knew they saw her for her and the rest is just a part of her – lessons learned young and accepted. 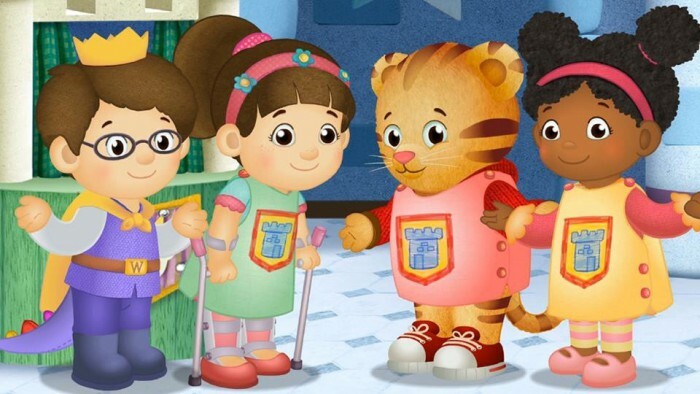 You can watch this Daniel Tiger episode #133 (S04E03) on PBS Kids, Netflix, and Amazon. If you are not a subscriber, you can download a copy below. This entry was posted in Diversity & Inclusion, For Everyone, Tips and tagged AFOs, Braces, Children's Show, Crutches, Daniel Tiger, Diffability, Disability, Diversity, Inclusion, New Friend, We are different, We are the Same. Copyright Notice: © Christy Lloyd and AFOwear, 2015. Unauthorized use and/or duplication of this material without express and written permission from this blog’s author and/or owner is strictly prohibited. Excerpts and links may be used, provided that full and clear credit is given to Christy Lloyd and AFOwear with appropriate and specific direction to the original content. ©2015 AFOwear, LLC. All Rights Reserved.